Guns N’ Roses are giving fans a behind the scenes look at the Not In This Lifetime tour in a newly-released video package. 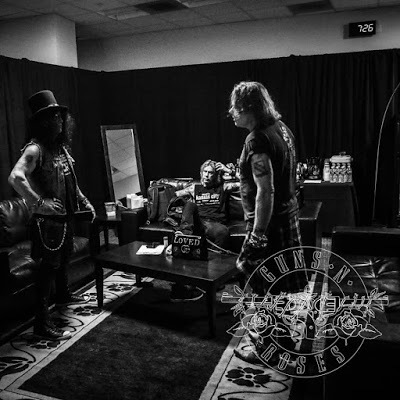 The montage presents the pre-show rituals by members of the band, led by the reunited trio of Axl Rose, Slash and Duff McKagan. The three-year reunion run, which launched in Los Angeles on April 1, 2016 is now among the top five biggest-selling concert tours in music history with gross sales of more than $475 million. Currently on an extended break, Guns N’ Roses will resume the tour in Berlin, Germany on June 3. On June 29, the band will release multiple expanded reissues of their 1987 album debut, "Appetite For Destruction", featuring memorabilia and dozens of previously-unreleased songs. Watch the video here.